Quick and healthy meals for kids: Introducing"What's cooking!?!" Introducing the series on quick to prepare, nutritious meals that will have your kids asking for more: What's cooking!!! I will be sharing tried and tested recipes that have passed the tough controls of big sister and my not-so-little-anymore baby E.
Today's recipe is the Winter potato soup. Recipe history: this recipe was born out of desperation, one Saturday in early autumn when I had no clue what to feed the kids for lunch with lunch time fast approaching. I wanted them to have a hearty lunch and I was desperate for something different from the usual pasta or steamed potato etc. I have made this soup using different types of vegetables. It's a good way to use left over boiled potatoes, and adding the vegetables helps you pack some extra vitamins in too. 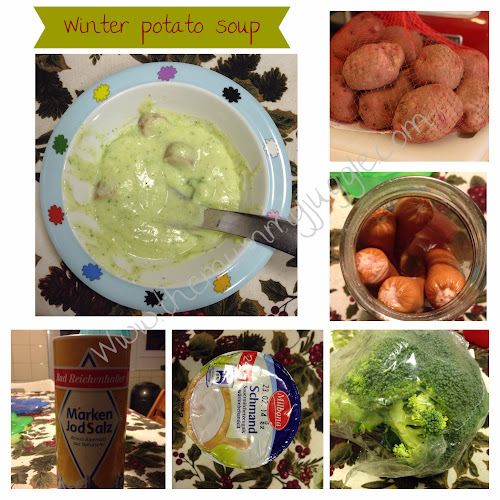 .It's quick and simple to make, if you are using pre boiled potatoes, you only need 10 minutes or so. I have made a short video about how I make my winter potato soup. Guten appetite! !